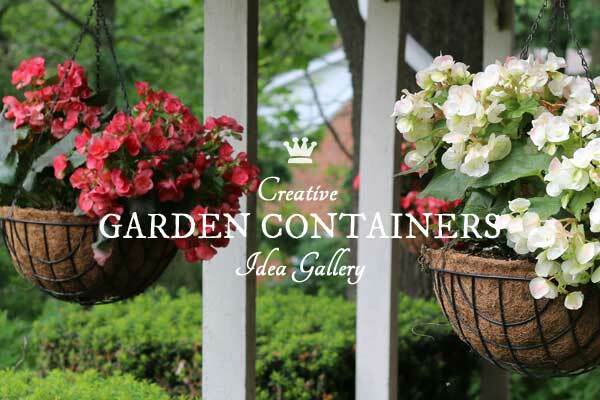 After publishing 30 Creative Garden Container Ideas, I discovered a whole bunch more from garden tour visits this summer. Every time I think I’ve seen every possible idea for planters, I discover something new. 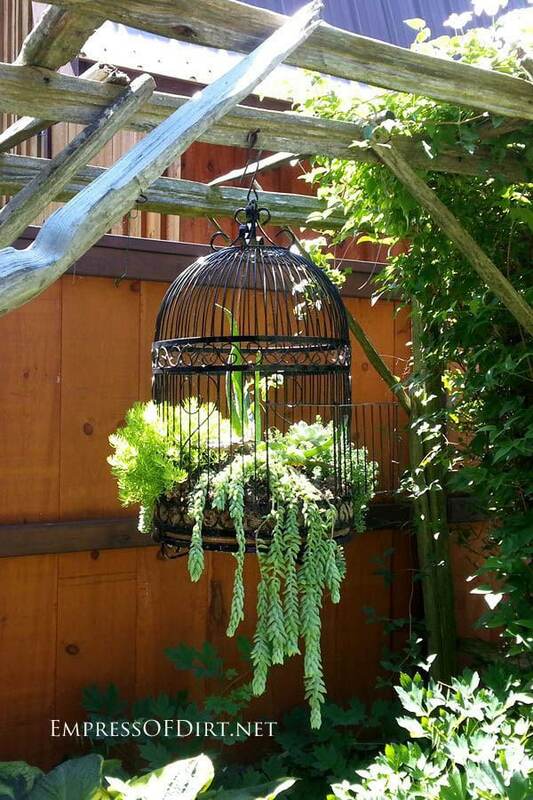 This is a perfect use for older bird cages which are really not suitable for birds! The wire could be spray painted any colour but I really like how the black looks in contrast to the plants. You can see examples of antique bird cages here on Amazon (affiliate account). To plant an item like this, it’s easiest to find a container or containers that fit in the base of the cage (instead of trying to plant directly in the cage). This has detailed instructions for using a birdcage as a planter. 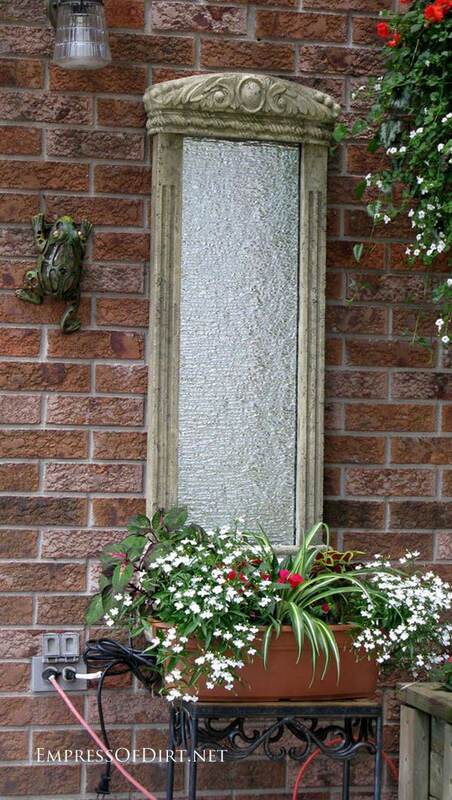 The bird cage you see here was photographed in Susan StLouis‘s garden in Goderich, Ontario. If you ever get a chance to see her garden on a tour—go! It’s truly unique and wonderful. 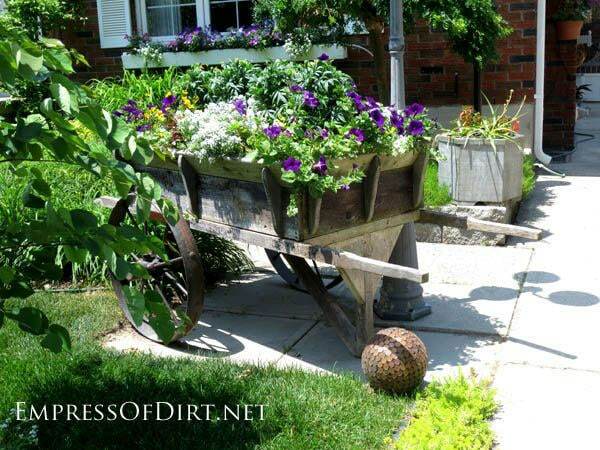 I don’t know how well those wheels would work but this old cart certainly makes a fine planter. 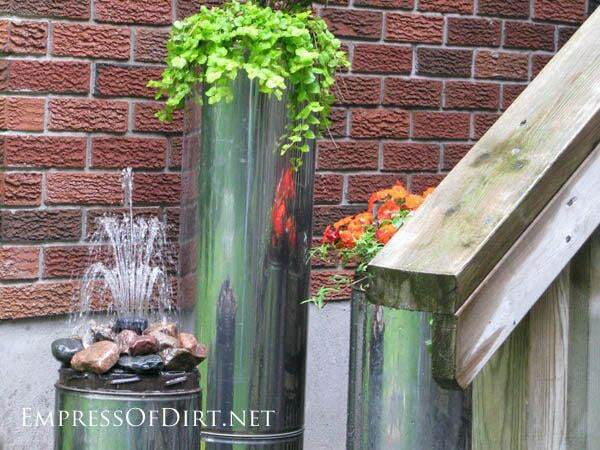 This is a great idea—take various metal tubes or cylinders found in home reno supply stores and turn them into planters. Insert smaller garden pots inside and wa-la! Nice, modern look for the garden. 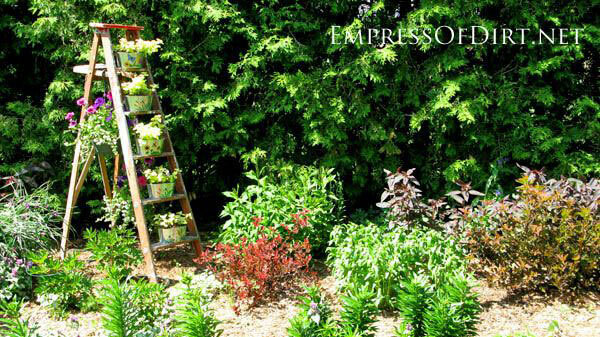 It’s an old idea but still a great idea: use an old wooden ladder to hold a series of planters, adding vertical interest to any garden bed. And don’t think you have to use an old ladder. These have become so popular in recent years that sometimes it’s cheaper to buy a new wooden ladder instead. Plus, you can give it an aged look if you prefer. 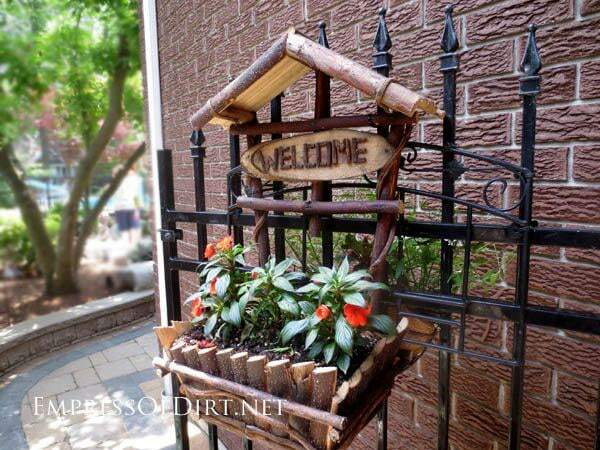 This twig planter is beautifully made and looks great hanging on the black iron gate. 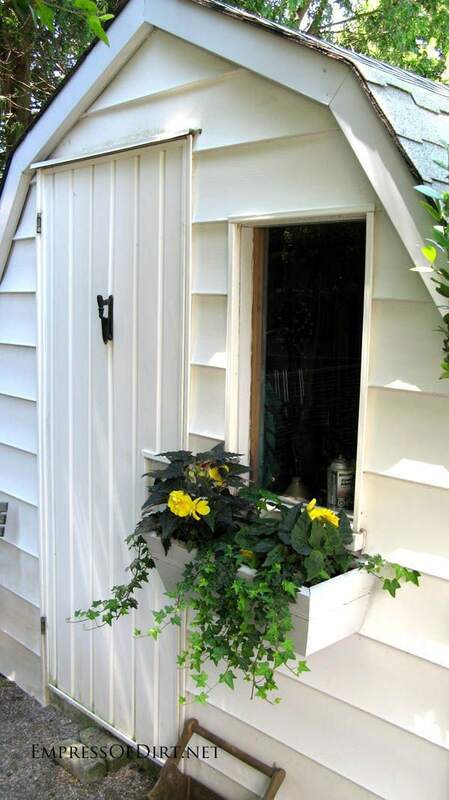 If you’re going to have an all-white shed and window box, be sure to plant eye-popping colours like these ones! I first made my pond in a raised bed or ‘pond in a box‘ years ago to fill in a garden bed near my front door where the soil was so poor nothing would grow. I could have just planted a raised bed, but the idea of having the pond in an area where we could enjoy it every day as we went in and out of the house was very enticing. 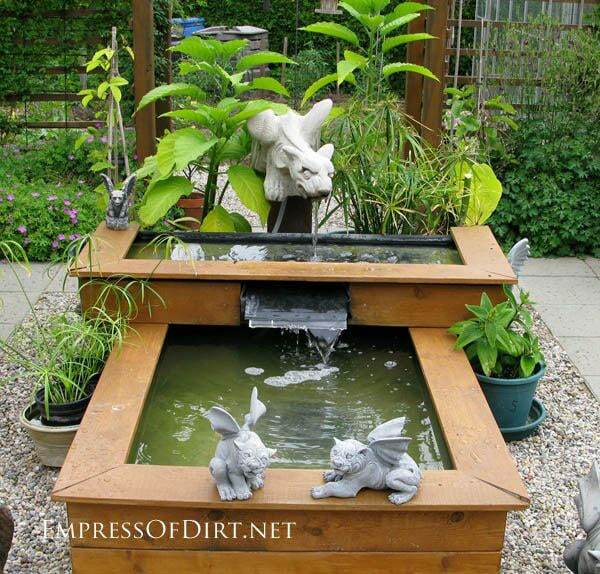 This pond in a box (above) has a extra tier to create a waterfall from the top level into the pond below. This is a clever way to make a planter stand more interesting: add a mirror, or in this case, faux mirror, on the wall behind it to give it greater majesty. 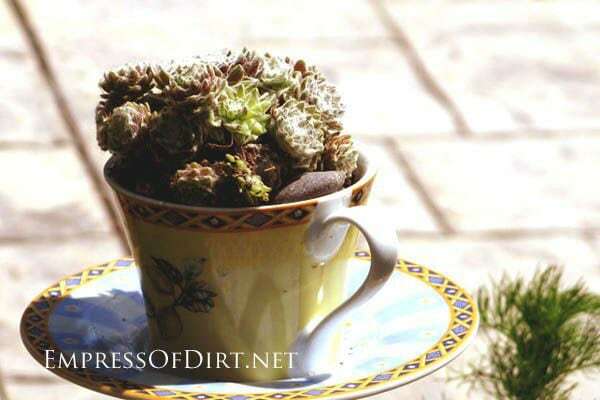 A classic idea: using teacups and saucers as little planters. Here’s instructions for How to Make Hypertufa Pots. 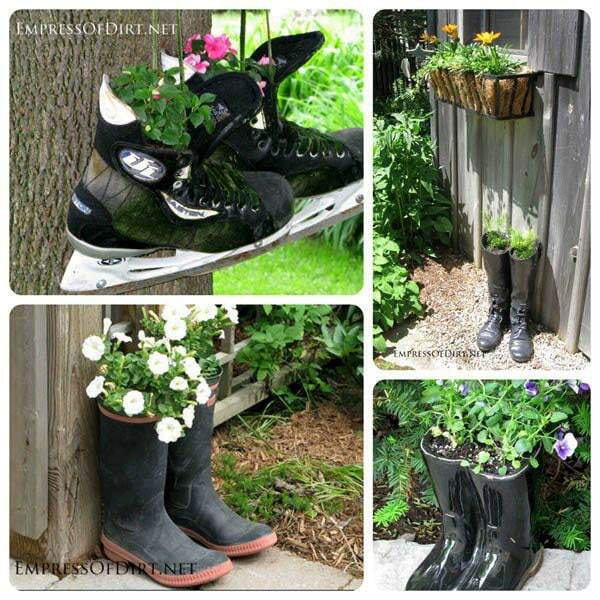 I saw so many of these this summer—shoes, boots, skates—all used as planters. Some are real, others are ceramic look-a-likes. 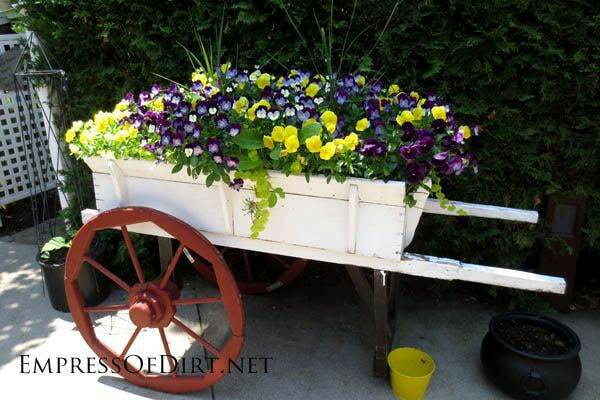 Another great farm cart converted into a garden planter. I would love to have one of these. 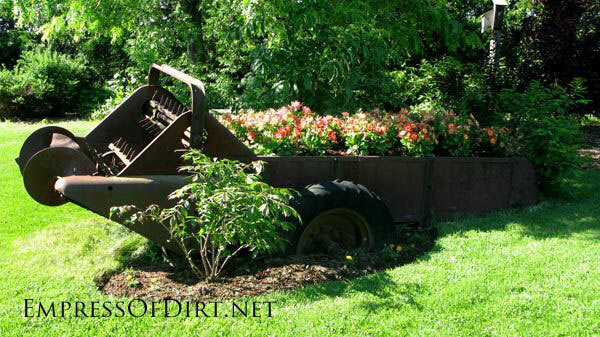 I have a whole gallery of wheels in the garden here. 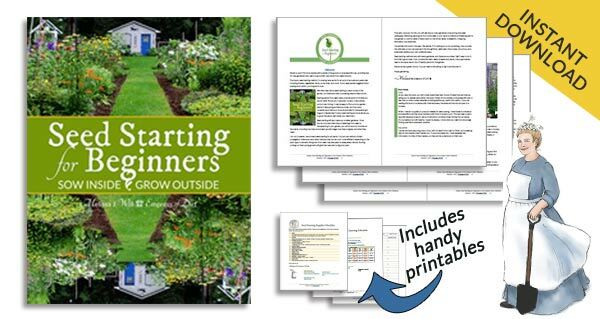 This has everything you want to know about growing plants in containers! Flowers, herbs, veggies, and more! 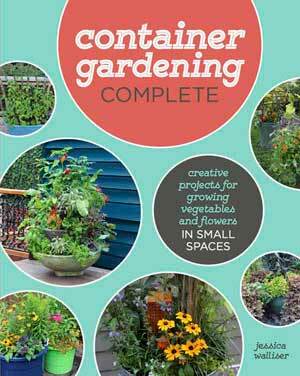 It’s packed with useful information, creative container projects, and lots of beautiful photos. I have to say, if it was a choice of cashing this one in as scrap metal or planting it, I’d probably go for the cash. But it does provide lots of room for flowering annuals! I have a bunch of these maple syrup sap collection buckets but I’ve never been able to decide what I want to do with them. 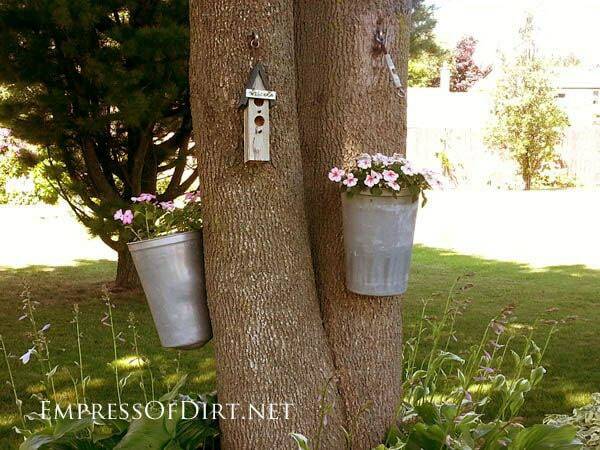 I think these ones look great as planters on the tree. 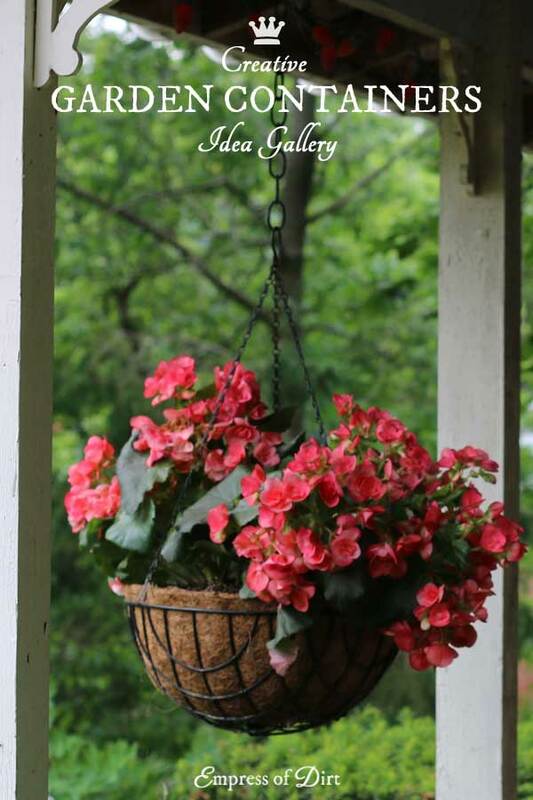 How to Make a Birdcage Flower Planter | Free a bird! 22 Flower Containers with Beautiful Plant Combinations | Time to make a list! Last year I left an old bed in my front garden. I painted it and decorated with some flowers (on it and around it). This year it looks awesome- when I look the bed it is like I see the Sleeping beauty’s bed after many years of sleeping. Totally loving the bird cage, I bet it gives a splendid drainage. I think if you’re a fan of tomato upside-down growing this would be perfect aesthetic-wise(and not only)! Yes, that would be fun with upside-down tomatoes! I love the birdcage. I tried to find some big enough for flowers but where do you find any?? The maple sap buckets are so adorable! I don’t know where I’d get my hands on those in NJ but I’d love to do that on a big tree I have out front. Thanks for the fabulous ideas!